256 records – page 1 of 6. File consists of a collection of photographs which were taken on November 29, 1998 to document the opening of the Love farmhouse exhibit. 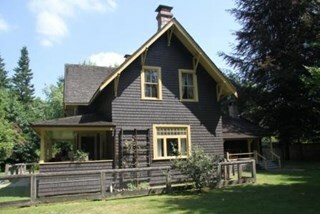 Photographs include detailed views of the completed restoration and exhibit of the exterior and interior of the farmhouse with staff, members of the public, officials and Love family descendents; the Opening Ceremony in the Burnaby Village Museum administration building and the cutting of the ribbon on the front porch of the Love farmhouse by Mayor Doug Drummond and Love family descendents. Photograph of the chimney and north west wall inside the Love farmhouse kitchen. Both the chimney and wall are painted. The photograph was taken while the house was still located at 7651 Cumberland Street before being moved to the Burnaby Village Museum in May 1988. Photograph of the Love farmhouse with a Model T ford car parked out back alongside the back wall of the kitchen. William and Sarah (nee Love) Parker purchased the Love farmhouse at 1390 Cumberland Road in 1928 after Sarah's father, Jesse Love died. William and Sarah lived there with their three children Albert, Bill and Elsie until 1961. Photograph of the rear of the Love farmhouse surrounded by a large snow bank. There are icicles hanging from the rooftop of the main house and kitchen porch. In 1928 after Sarah Parker's father, Jesse Love died, William and Sarah (nee Love) Parker purchased the Love farmhouse located at 1390 Cumberland Road. 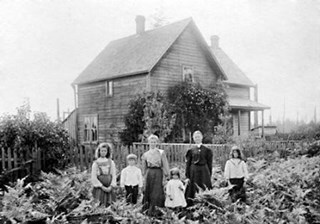 They lived there until 1961, with their three children; Albert, Bill and Elsie. Jesse and Martha Love were the orignal owners of the house where they raised eleven children. Photograph of an an unidentified woman sitting on a large wood framed swing with a group of unidentified children sitting at her feet.The swing is in the yard of the Love farmhouse. There is a tall tree to the right and several trees in the background, the ground is covered in tall grass. Photograph of a large crane lifting the roof off of the Love farmhouse as it is being prepared to be moved from 7651 Cumberland Street to Burnaby Village Museum site. The roof had to be removed in order for the house to clear the powerlines when being transported to the museum at Deer Lake. The house is sitting on the flat bed of a large truck. Photograph of a crane removing the roof of the Love farmhouse as it is being prepared to be moved from 7651 Cumberland Street to Burnaby Village Museum site. The roof had to be removed in order for the house to clear the powerlines when being transported. The house is sitting on the flat bed of a large truck.